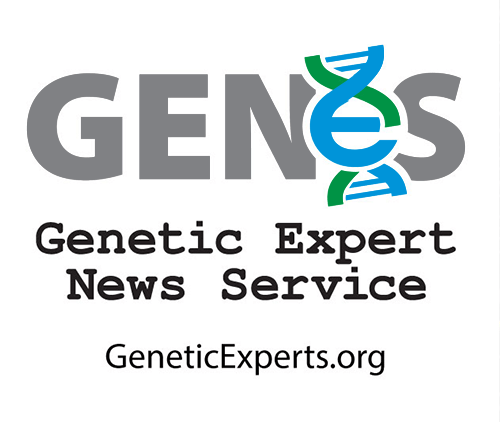 "Instead of providing people with useful information, mandatory GMO labels would only intensify the misconception that so-called Frankenfoods endanger people's health…. Ultimately, we are deciding whether we will continue to develop an immensely beneficial technology or shun it based on unfounded fears. 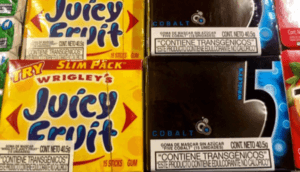 "It’s encouraging to see the number of nations that have embraced labeling. Yet, at the same time it’s frustrating and offensive that Americans are denied the information about their food that those in Kenya and Saudi Arabia receive. The United States is the 65th nation–joining about one third of the world’s countries–to require mandatory labels on foods containing genetically modified ingredients. The US, which passed a labeling law in July 2016, joins Russia, Brazil, all of Europe and nearly a dozen Asian nations. Federal agencies have until 2018 to establish standards, which will require the disclosure of GM ingredients through text, a symbol, toll-free number or a digital link (such as a QR code that can be read by a smart phone.) 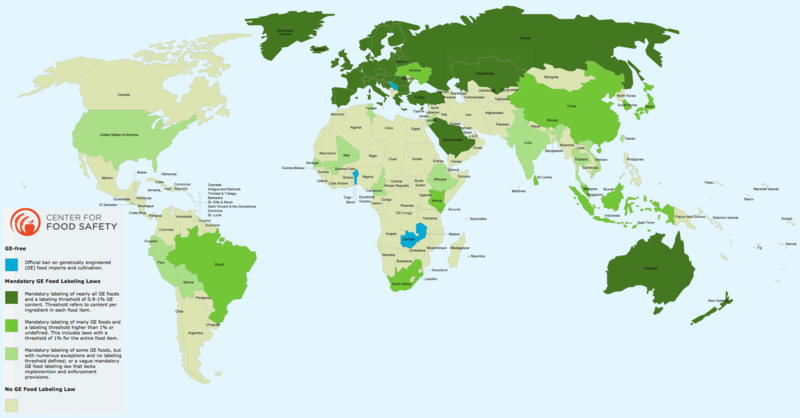 Among the nations that have no mandatory labels are Canada, Mexico, Argentina, Chile, Pakistan and most of Africa. Mandatory labels—dictated by the percentage of GMO ingredients in a product or how the seed was developed—generally take one of two forms. Most regulations require only that the GM items be noted in the ingredients list on a package. Less common are rules mandating a more conspicuous location on the label. The US has carved out a third option. Despite the fact that more than 275 science organizations have concluded that GM foods pose no more health concerns than conventional or organic foods, dozens of nations around the world have enacted labeling laws requiring the disclosure of GM ingredients..
Twenty-eight of the world’s nations requiring GMO labeling are found within the European Union, which has long held a somewhat hostile view of genetic modification of foods and despite its importation each year of more than 30 million tons of biotech corn and soybeans used for animal feed. The continent’s uneasy relationship with GM products stems from numerous food scares since the 1990s, most notably the mad cow crisis. Europe has embraced a precautionary regulatory framework toward food—foods suspected of causing health or environmental problems can be restricted or banned even if the links are not proven. The EU countries and other countries that have developed a regulatory structure based on how a product is made—the process—and not the final product. 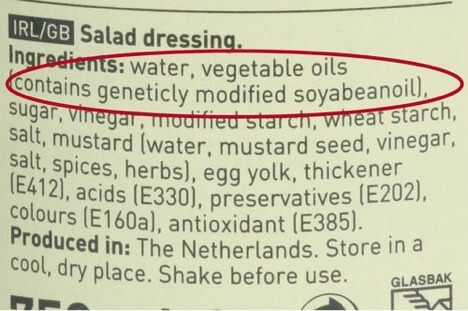 The EU considers a GMO to be any product of “techniques of modern biotechnology called gene technology.” That differs substantially from non-labeling nations, where regulators use what’s called a product-based evaluation, requiring labels only if there is a significant nutritional or compositional difference. So if a GMO soybean is essentially identical to a non-GMO soybean, it receives no special treatment. Such has been the stance of US regulators since a May 1992 ruling by the Food and Drug Administration in which it concluded there was no reason from a health or safety standpoint to require the labeling of genetically modified foods. The FDA reinforced its position in a 2015 letter to activists rejecting their petition to require labels on a GM salmon. The agency is not aware of any valid scientific information showing that foods derived from genetically engineered plants, as a class of foods, differ from other foods in any meaningful way. GE (genetically engineered) foods don’t present greater safety concerns than foods developed by traditional plant breeding. 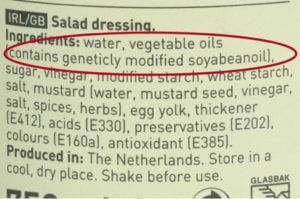 … However, if a food derived from a genetically engineered plant is materially different from its traditional counterpart, the labeling of that food must disclose such differences. Mandatory labeling is a … complex issue that involves competing values. There clearly are strong nonsafety arguments and considerable public support for mandatory labeling of products containing GE material. On the basis of its review of the evidence on health effects (Chapter 5), the committee does not believe that mandatory labeling of foods with GE content is justified to protect public health. If you consider what the opponents of GMO labeling proposed, and what the voluntary and state by state options would have offered, it’s hard not to see how this mandatory federal legislation is a constructive solution to a complex issue. … This bill reinforces Organic as the original non-GMO market claim and assures consumers that the USDA organic seal is the gold standard for consumers looking to avoid GMO’s, toxic pesticides, and so much more. While some GMO opponents applauded the bi-partisan federal measure, others were sharply critical. They had wanted an on-label GMO designation. They also objected to the use of QR codes scanned with a smart phone, arguing that many consumers, particularly poorer ones, would not have easy access to the information. Yet to be resolved are what types of genetically modified ingredients will be covered by the law, particularly highly refined oils and sweeteners that contain no genetic material after processing but are derived from GM crops. Australia’s policy argues that there is no way to tell the difference between sugar derived from a GMO crop or a non-GMO crop. But the European Union, with its traceability and labeling regulations does require labeling of these highly-refined substances, based on an April 2014 amendment. Uncertainty revolves around how the US and other nations will handle ingredients and products derived from newer technologies (including RNAi and gene editing techniques such as CRISPR)— things the non-browning mushroom, non-browning apple and low-acrylamide non-bruising potato, which so far have been introduced without labeling in the United States. Anti-GMO leader Gary Hirshberg, founder of the pro-labeling group Just Label It, vowed regulatory and marketplace battles ahead to expand the definition of what is a GMO, and there are expectations some of these issues will be resolved in court. 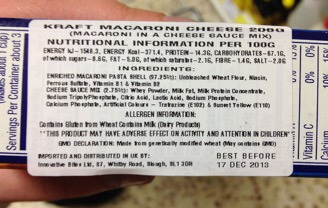 It appears that no country requires labeling of foods produced with the aid of GM enzymes, including the vast majority of hard cheeses produced in the US and Europe. Such cheeses were traditionally produced with rennet – found in the lining of calf stomachs—which provides the chymosin that helps turn milk into cheese. Today, most of the chymosin used by cheese makers is the result of genetic modification, through a substance called fermentation-produced chymosin or FPC. While products made with FPCs are exempt from international labeling laws, they are rejected by the Non GMO Project, which considers them to be GMO. 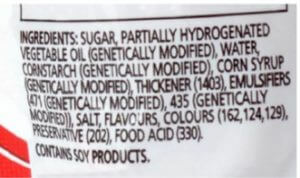 Mandatory labeling laws generally come into play based on the GMO percentage of any particular ingredient in a food product, although some base the percentage on the entire food item. The most restrictive rules—in places like the European Union, Saudi Arabia, Turkey and Australia—have a 0.9 percent threshold. Others allow a greater degree of GMO inclusion, with South Korea at 3 percent and Japan at 5 percent. US agencies have not yet determined a cut-off threshold under the mandatory labeling bill signed into law in July. Labels can be divided into two categories: The first requires the consumer notification to be included in the list of ingredients. The second requires the notice to be placed elsewhere on the package, in a conspicuous area. The latter option has been a target of criticism from some experts. “It’s like putting a skull and crossbones on a food product. GMO labels would be telling people this is toxic while there’s no definite proof it is,” said Tim Richards, agribusiness professor at Arizona State University. “The list of ingredients must indicate “genetically modified” or “produced from genetically modified [name of the organism]”. Australia and New Zealand require that GMO ingredients be noted in the ingredient panel, unless the entire item is genetically modified. In that case, the information has to be included next to the name, according to the Food Standards Australia New Zealand agency. The label for the GM agricultural product should be on the package, the container, or the storage facility of the product. The label must be eye-catching, with a different color from the background color… The label for processed food should be created with a non-erasable ink in an eye-catching form on the package or container of GM food. Brazil, the world’s second largest producer of GMO crops, requires a label “when more than 1% of a product marketed as food for human or animal consumption contains or is produced from GMOs.” The notice is in the form of a black T superimposed on a yellow triangle. 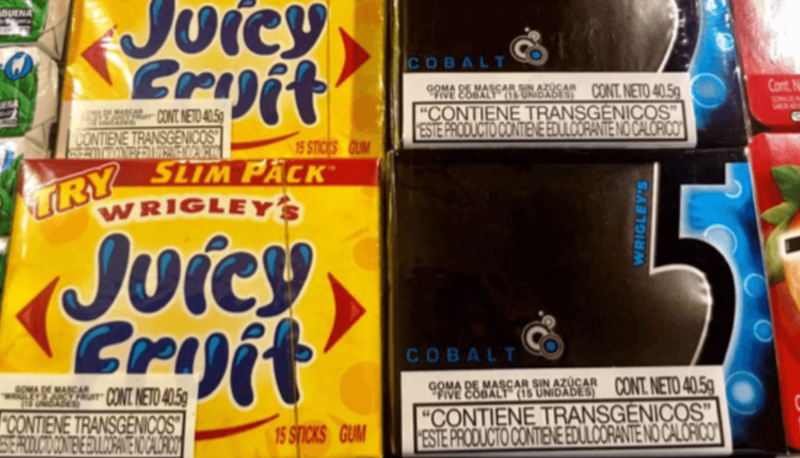 Ecuador, which bans the growing and import of GMO crops and seeds, requires a front-of-package label for processed food containing genetically modified ingredients that is akin in size and presentation to a tobacco warning. Codex has adopted principles and guidelines to assess food safety of foods derived from recombinant-DNA plants, animals and microorganisms. If a government chooses to build a regulatory mechanism to address the food safety of so-called GM foods, then they can use Codex text as a basis for it. This being said, each government is free to adopt its own policy as to the use of GM organisms in the agriculture and other sectors. At the moment, there are no internationally-agreed recommendations on the food labelling of GM foods. Governments are therefore applying their own regulations. 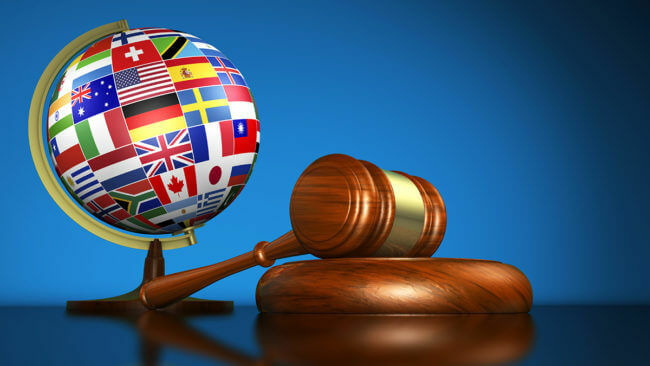 As a result, member countries who choose to adopt mandatory GM labelling requirements should avoid any WTO challenge based on the claim that such requirements restrict international trade.